Last post I laid out the foundations of narrative structure. Today I want to discuss what I consider to be the single most important aspect: The Dramatic Question. If you understand nothing else about structure but understand the Dramatic Question and the Moment of Failure (which I’ll get to in a bit) you’ll probably end up with a fairly well structured story. Those sound simple, right? Simpler is better when it comes to the Dramatic Question. But it’s not always easy to be simple. You have to know who your character is and what their dilemma is before you can craft a nice simple Dramatic Question. But then if you haven’t figured out your character and their dilemma you’re not really ready to start writing yet! Do not think the Dramatic Question determines the quality of your story. It’s simply the spine on which you’re going to build your story. What you hang on that spine is going to determine how good your script is. However if your spine isn’t solid, none of the other stuff is going to hang properly. The moment when the Dramatic Question becomes clear is the Catalyst. I’m going to get into that in more detail in a later post, but for now just understand that the Catalyst is the moment where the audience understands who the main character is and what their basic dilemma is. They may not understand the entire dimension of the problem, but they have an idea what the story arc will be about. So in E.T. (written by Melissa Mathison) the catalyst is when Elliot sees E.T. for the first time. We don’t yet know that his mission will ultimately be to get E.T. home or even that first he’ll have to hide E.T. And we don’t know that E.T. will start dying from the Earth environment. But we know that this kid who nobody takes seriously just found a little lost alien – and that some scary men are looking for it. We have a character and dilemma. Once E.T. takes off in his space ship, the movie ends. Credits roll. The story is over. Compare that to the Lord of the Rings trilogy (screenplays by Fran Walsh & Philippa Boyens & Peter Jackson). The Dramatic Question of the trilogy is “Can Frodo destroy the ring?” He does so in the last movie, but then it continues for another forty minutes or so. Kind of got tedious didn’t it? The story was over. We wanted to go home. The structural beat where you answer the Dramatic Question is called the Resolution. I’ll get into that more in later posts as well. There’s one other critical structural concept you need to understand. That is the moment of apparent failure (or success). Whatever the Resolution to your Dramatic Question is, there needs to be a moment where the opposite appears to be inevitable. So if your character succeeds at the end, you need a moment where it appears the character will fail. And if your character fails at the end, you need a moment where they appear to succeed. In screenwriting, we call this moment of apparent failure/success the Act Two Break. Again, I’ll go into more detail in future posts. If you have a strong Dramatic Question that defines your movie and you have a moment of Apparent Failure/Success, then your innate understanding of storytelling built from having heard stories your whole life will probably lead you to write a fairly well structured script. However that doesn’t mean there’s nothing more to learn about structure! You can still get into trouble and the more you understand about the mechanisms of storytelling, the easier time you’ll have getting out of trouble. That’s what my next few posts will cover. It also might be good at this point to emphasize that a well-structured script isn’t the same as a good script. To stretch the “spine” metaphor, just because a person doesn’t collapse under the weight of their own body doesn’t mean they’re beautiful, intelligent, interesting or emotionally complex. There’s a lot more to good writing than solid structure. Which is lucky for me! Otherwise this would be a very short blog. Story structure is generally considered to be the most critical skill of the screenwriter. I don’t know if I completely agree with this, but I do think that if you don’t start with solid structure it is nearly impossible to create a successful screenplay. I learned story structure (of the three-act variety) in grad school at USC. I’ve also read dozens of books on the subject, most of which added to or altered my approach in some ways. More importantly, I’ve written somewhere around twenty screenplays, some of which were bad, some of which were good, some of which got me an agent or paid writing work and in one case got made into a big hit movie. Each experience helped me hone my approach to story development. When I got hired to teach my screenwriting class at Art Center College, I started building the syllabus around what I was initially taught. But I quickly realized some of that stuff I never used anymore. Plus, I wanted to include the other things that I had learned since. So I adjusted the class to reflect my then-current “real world” approach. And it was shortly after that that I started this blog, where I addressed story structure in some of my earliest posts. In the two years since I have had the experience of helping hundreds of students hone their own screenplays. I’ve seen the mistakes they commonly make and adjusted my teaching approach accordingly. I’ve also become a better writer myself in the process. And as I look back at my initial posts on structure from 2008, I find that while they are still generally true to the three-act concepts as I see them, I feel like I have outgrown them a bit. So, in Hollywood parlance, I’m going to do a “reimagining” of screenplay structure over the next several posts. I want to start by discussing what I see as the foundation of narrative. This may seem a little basic at first, but there is a method to my madness. I want to show that the three-act approach is not some Hollywood formula but grows out of the fundamental nature of story telling. So let me start by addressing the question: What is a story? A story needs three things. First, we need a character. The character need not be human, but he or she must behave in recognizable human fashion – Mickey Mouse, for example. (The fancy word for non-human characters made to behave like humans is “anthropomorphized.”) If you don’t have a character you may be writing a travel guide, op-ed essay, or a scientific treatise but you are not writing a story. Next, the character must be facing some kind of dilemma. I don’t really care to hear about someone whose life is just fine. I mean, that’s great for them but how does it affect me? Whatever it is that causes us to respond to made-up stories has something to do with watching how people deal with problems. Finally, a story needs a resolution. I’m watching/listening/reading to find out how this character deals with their problem. I’m not going to be satisfied until I see how it all comes out. If you have those three things you have a story – even a thirty-second narrative commercial has them. A young man (character) is not getting good gas mileage (dilemma) so he tries a different type of gasoline and his mileage improves (resolution). But simply having a character, dilemma and resolution doesn’t necessarily make the story dramatic. If you have a guy sitting in his living room whose dilemma is that he’s hungry and he goes into the kitchen to make a sandwich you have a story…but not a very dramatic one. There are two things that affect how dramatic your story is: stakes and obstacles. The more that’s at stake for the character and the greater the obstacles standing in the way of successfully resolving the dilemma, the more dramatic your story becomes. Of course “dramatic” isn’t quite the same as “good” but we’ll get to that. So that’s the foundation of my approach to story. 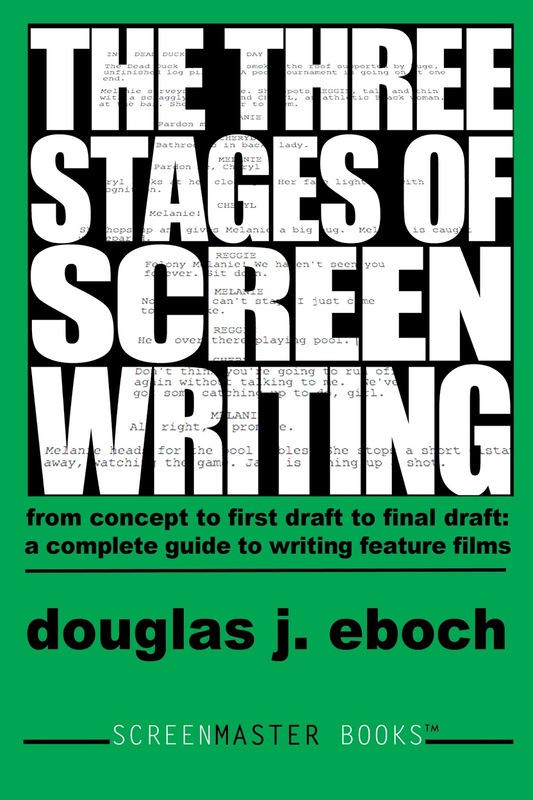 Over the next few posts I’ll discuss how I apply that to building a screenplay and look at each act in depth. I recently ran into my friend and colleague Ross LaManna (creator of the Rush Hour franchise and chair of the undergraduate film department at Art Center College). We got to talking about the impossibility of selling an original movie pitch to a studio these days. This change in the way the industry is functioning has been a popular topic among screenwriters the last couple years. Things have been changing over the last decade. First, writers started crossing back and forth between TV and film more frequently (partly because the improving quality of TV writing removed the stigma). Now people who write movies also frequently write comic books, video games and webisodes. The feature business has changed dramatically over the same time frame. A feature film used to be considered a good way to launch a franchise. There have always been movies based on books (Gone With the Wind) and plays (Casablanca). But big multi-media franchises like Alien, Star Wars, Ghostbusters, Predator, the Terminator, Raiders of the Lost Arc and the Matrix got their starts as original feature films that then spawned games, toys, TV shows and comic books. These days it's incredibly rare for a studio to take a leap on that kind of property if it hasn't made an appearance in another medium first. Why? That could be the topic of a whole other post. The main reason is fear. The studios have all been bought by big corporations (or in the case of Disney grown into a big corporation where the movie studio is just a small division). Corporations don’t like risk and they don’t like subjective decisions. Deciding whether a spec script is good or bad is risky and subjective. To a corporation it’s much safer to buy a property that’s “proven” itself in another medium. The fact that statistically this approach does not in any way improve the chance of success of the resulting movie is conveniently ignored. Also, it used to be that most movies were considered viable products in and of themselves. Releasing a feature film was a perfectly acceptable business model even if it didn't spawn sequels or clothing lines. But these days that is also becoming rare. The studios and their corporate overlords think it's just too hard to make money on a stand-alone feature film. They're increasingly only interested in franchises with merchandising potential. Now of course there is still work for the feature film screenwriter in this new Hollywood order. Somebody needs to adapt the comic books, video games, board games and paintings (yes somebody bought the movie rights to a painting) into movies. And you get paid a pretty good fee to do it. The only kind of writing that generally pays more is TV writing. But if you’re interested in telling original stories, as I am, then I’m starting to think the best approach is change your perspective on what you do. Maybe we shouldn’t think of ourselves as screenwriters so much as creators of intellectual property (also known as IP). I’m currently writing content for a Facebook game while Ross is about to have a graphic novel he co-wrote published. Both are based on ideas we originally conceived of as feature films. And we both think we’re more likely to get the film made by selling the rights to our IP after it appears in another form. I could list dozens of other established screenwriters who are taking a similar approach. No matter what form it takes storytelling at its core is based on fundamental things: character, conflict, emotion, resolution. But each medium is different. Executing a scene in a comic book requires completely different things than executing the same scene on film. Time works differently. There’s no motion. Space is at a premium. You have to capture key moments that convey the broader scope. So if you’re going to try to launch your film ideas in another medium first, it would behoove you to study that medium carefully. There are other issues to consider. Who pays for creating these games, comic books, etc.? If you don’t want to spend your own money to self-publish you have to sell your ideas to someone else. But if you can’t convince a comic book company that your idea is good you probably won’t be able to sell it in Hollywood either. And of course you have to be careful in the contract about who gets an ownership stake in the underlying IP. Nothing is ever easy! This business stuff is cyclical, of course. But the cycles tend to be measured in decades. Are you willing to wait ten or twenty years to get your original ideas out there to an audience? I’m no longer thinking of myself as a “screenwriter” but as a “creator of intellectual property.” Maybe you should consider that as well. In the pitching class I teach at Art Center College one of the things we discuss is the various types of meetings that screenwriters have in Hollywood. I think it’s useful to have some idea of what’s going to happen when you go into your first meeting. If nothing else it might help you to relax a little. And, truth be told, even experience screenwriters tend to spend an inordinate amount of time discussing this kind of thing. So for those of you who have not yet had your first Hollywood meeting, today I will describe what happens in a “general” meeting and what I recommend you do to successfully navigate one. This is based on my own experience doing dozens – maybe even over a hundred – of these. You get a general meeting when someone has read some of your work and wants to meet you. The majority of the time you will be meeting with one person but I’ve had general meetings with as many as four people. There might be more than one producer or development exec at the company that wants to meet you and/or there might be an intern or assistant to take notes. First, what to wear. You do not need to dress formally. Though this is akin to a job interview it is for a very casual job. And you’re supposed to be creative. Looking like a lawyer might not help your case. On the other hand you shouldn’t look like you just walked off a construction site, either. Dress in something that makes you look good, the kind of thing you’d wear out to a nice dinner with friends. And take a shower, please! That guy didn’t have to make that call right then. He did it just to keep me waiting. But that’s okay. The wait is actually good. It gives you a chance to settle in and get your bearings. And in case you’ve just had to walk half way across the studio lot on a hot September day it gives you a chance to cool down. Before you go in the assistant or receptionist will ask if you’d like anything to drink. I’d recommend water, even if you’re not thirsty. You may get dry mouth during the meeting, plus it gives you a prop. If you need a few seconds to think over how to answer a question you can take a drink to buy some time. Don’t ask for soda – it will make you burp. And avoid coffee or tea. They may not cool down enough to drink before the end of the meeting. I know…this stuff seems silly. But sometimes little things like this can make the difference between a good meeting and a bad one. Or at least they can affect your comfort level. Mostly you’ll meet in the producer or exec’s office. Sometimes you’ll meet in a conference room. If it’s an office they most likely will have a seating area. They’ll come out from behind the desk and meet with you in that more casual setting. Those seating areas usually have a couch. A really soft, comfy couch. Try not to sit on it. You will sink back into it and it will sap you’re energy. If you do end up on the couch sit forward on the edge. And if there are multiple people in the meeting try to pick a spot where you can look at all of them with relatively little head movement. You don’t want to be swiveling your head back and forth like you’re at a tennis match. It is critical that you have an answer to this question. Although technically this is a get-to-know-you meeting, you will be pitching your next idea. The pitch should be fairly casual and not too long. They probably aren’t buying…but they might. Mostly you’re trying to let them know you have other good ideas and hopefully getting them excited to read the next spec when it’s done. But you never know…if the pitch is good enough you might just sell it in the room. By the way, the pitch should be for the same genre and kind of movie or TV show as the work that got you the meeting. Don’t pitch a sitcom if they brought you in based on your feature thriller script. One point of disagreement among writers is how many ideas you pitch in these situations. The answer varies from one to three. The three idea advocates think that it’s good to show that you have a lot of ideas. Having more than one is also helpful if they already have something like your first idea in development. And then you say goodbye and leave. Whatever happens, don’t get too stressed out. There will be other meetings in your future. *A doorknob pitch is so called because of the image that you would deliver it as you’re hand’s on the doorknob on your way out; kind of an “oh, I almost forgot” attitude. You don’t, of course, actually do it that way. But it comes at the tail end of the meeting and is done in a quick, off-the-cuff manner. Open Assignment – an assignment for which the studio is actively looking for a writer. Pitch Book – A book with photos and art – often culled from outside sources, sometimes original – that is used to show the tone and look of a movie during a pitch. Common for director pitches, rare for writer pitches. High Concept – a movie idea that can be easily summarized in a compelling sentence. Execs like this because it means the movie will be easy to sell. If they get it in one sentence, so will the public. Low Concept – a movie idea that requires lots of explanation to make its appeal apparent. Execution Dependent – an idea that depends on quality execution to be successful. Hard to sell as a pitch, probably must be spec-ed. Most low concept ideas are execution dependent. Logline – A one-sentence description of the movie concept that captures what it is. A lot easier to create for a high concept movie. Often used on Tracking Boards and Coverage. Tracking Boards – Private online message boards frequented by a group of development execs and/or their assistants which track all scripts and pitches coming onto the market (often by logline). Many writers fear that someone will bad mouth their script on the tracking boards and others will then reject it without reading it. Sometimes just referred to as “the boards” in the development community. Coverage - Producers and development exec have readers read scripts and do coverage so the producer or exec doesn't have to read the whole script. Coverage usually includes a logline, summary, and evaluation. Readers - Fairly low paid people or unpaid interns that read so producers and development execs don't have to. Baby Writer – A new writer. Usually in TV. Hero Car/Prop/etc. – The representative item that will stand out in a group of items is often referred to as the “hero” version of the items. As opposed to the hero of the movie. Producers Polish/Courtesy Polish – Polite term for a free revision done without pay based on producers’ notes before turning a draft in to the studio. Used to be customary to do a single pass that involved a day or two of work. Lately has been abused to mean multiple major rewrites from writers who won’t stand up for themselves. Packaging – When an agency puts together multiple elements of a movie – script, director, stars and sometimes even financing – before taking the project to the studio. Agencies get a fee from the studio for doing this. Usually only the biggest agencies can package a movie. Boutique Agency – Smaller agency often specializing in only a few areas (For example: TV writers and directors or comedy). The Trades – Trade papers – Hollywood Reporter and Variety. Introducing you to the town – What an agent does with a new writer when they send a spec out to everyone who will read it.